6/24 - Scotty Adema snares USA Sprints "Barn Burner" at Auburndale Speedway! 6/14 - USA Sprints "Posse" Storm Auburndale Speedway! 6/10 - Scotty Adema Claims 5th in a Row in USA Sprints Racing! 5/6 - USA Sprints "Posse" Ride into Hialeah! 4/18 - The "Fort Myers Flash" Scotty Adema Strikes Again at Hialeah! 3/18 - Scotty Adema "Rockets" to Starwars Victory @ Charlotte County Speedway! 3/8 - Tim George flexes his muscles @ Hialeah with a very satisfying Victory! 3/1 - USA Sprints Posse Storms Hialeah Speedway! 2/7 - The Florida Sprints "Starwars Challenge"
1/19 - USA Sprints 2005 Southern Thunder Tour Gearing Up! 12/6 - USA Sprints Return to Charlotte County Speedway! Fort Myers, Florida -- 6-27-05 -- The Florida Sprint Car Association and the USA Sprints will meet heads up for The 2nd Annual Florida Challenge Series 2005 match races at Putnam County Speedway Saturday night July 2nd followed by another visit to the famed Volusia County Speedpark on Sunday July 3rd.These races will mark the 1st and 2nd legs of the Triple Crown which will crown a Florida State Champion for Dirt Sprintcars.The 3rd and final race is tentatively scheduled for October 2005 at a Track to be announced. Last year was washed out by the string of Hurricanes that cut short the Challenge Series and the whole racing season for that matter. "Mean" Gene Lasker was in position to take the title after a 2nd and 1st place win in only 2 races in 2004. This special match race was brought about by Otto Scrape and RC Roper the two Series Promoters and Track Promoters Mike Partin and Dicky Murphy from VCS. This was made possible when Scrape who is also a driver in the FSCA extended an invitation to the USA Sprints and RC Roper for this Race. The drivers will be competing for the overall purse but will maintain thier prospective points for each organization. In addition there is a 3 race point total that will be calculated to crown a Florida State Champion. These races have attracted National attention and will be covered by some of that same media. It is also understood that the Dirt Track Channel will be covering the races. The USA Sprints & FSCA Sprints Drivers are once again excited about this opportunity. Scotty Adema # 67 who leads the USA Sprints with 6 Wins and Top Point man Tim George # 1 will do battle against "Mean" Gene Lasker # 02 from Tampa Florida who has Won 4 races this year so far. Behind Lasker is the always tough Lee Scrape# 42 from Jacksonville who has 1 Win in 2005. Scotty Adema by circumstance of scheduling has enjoyed huge success on the Pavement thus far in 2005. Adema who is known as a pavement specialist has some onlookers curious to see how the South Florida driver will fare once the Southern Thunder Tour hits the dirt. Both Organizations bring racers who have Won hundreds of races and dozens of Championships into this special match race. Expectations are high from Florida Sprint Car fans. Some of the USA Sprints Stars looking for a Win include Greg "The Jet" Leonard # 85 from Wimauma. Leonard who Won last years VCS event will certainly be expected to be one of the challengers along with RC Roper "The Racin Cowboy" # 92 from Fort Myers. Top Rookie hopefuls are 15 year old Dakota "The Southern Outlaw" Stevens # 79 and Michael "Bones" Smith # 9 from Ocala. The 2003 USA Sprints Champion Shane Kriedler # 52 will make his 1st return to the dirt since last year. The FSCA Sprints have Otto Scrape # wee 3, Wes Scrape # 66, Mike Love # 7, and Bruce Durden who Won Last years event at Putnam as a USA registered Driver. Teresa Miller will also return in who own # 77 for the FSCA as will Dennis Misuraca in the 3d from Sanford Florida for the USA Sprints. There are several drivers that have run both USA and FSCA sanctioned events this year. The USA Sprints may have a slight disadvantage for lack of Track time on the dirt. One of the drivers who has raced with both organizations on both surfaces in 2005 is the young but experienced Tighe Schloss from Jacksonville. In addition to Schloss as a major player will be the one and only "Tiny Tim" George the current East Bay Raceway Park and USA Sprints Point leader. Most people are not aware that Tim could be the only sprint car racer in the Nation that races every week and changes back and forth each week between dirt and pavement. There are some who do this but with different cars. Tim has just 1 car for himself. In fact Tim has raced Saturday night at East Bay and then was at Punta Gorda the next day for a afternoon race.That is what makes a USA Sprints racer! Race anywhere against anyone on any surface with or without wings.Thats Tim George! One of the many interesting facts for these Challenge event races is that most every Florida Winged Dirt Sprintcar driver and Track will be represented. The contingent of USA Sprints Stars have been racing pavement only thus far in 2005 and for some of the drivers they have never raced on dirt in thier careers. Several of the East Bay Raceway cars such as Racer "Rick Byerly" # 30, Tim Holsten # 51 and Danny Jones # 99 from Tampa will be there flying the USA colors. Former TBARA standout David Slawiak who has limited experience on the dirt will be debuting Dave Link's # 63 Gambler. Coincidence is,Link's car was the last car that Gary Gimmler drove at Thundercross.We hope that at some point Gary will make his return to the Dirt and the USA Sprints as a driver. Rumor has it that 2004 USA Sprints Champion Andy "Hammer Down" Kelly # 11 might wander up north as well as brother David "Skeeter" Kelly # 12 from Plant City. This is sure to be a awesome Holiday Weekend for Florida Sprintcar Racing. Last years event was a very competitive race and some onlookers thought it was perhaps the best racing of the year. So make sure to mark this down on your calenders July 2nd Putnam County Speedway @ 7pm and Sunday night July 3rd at 6pm at Volusia County Speedpark. For more information call Otto Scrape @ 904-766-5915 from the FSCA or visit www.fscaracing.com You can also contact RC Roper c/o the USA Sprints @ 239-872-0168 or visit the website at www.usasprints.com. For additional Track info and or directions call Mike Partin from Putnam County Speedway @ 386-649-5210 for Saturday nights race.Please call Gloria or Vicky at Volusia County Speedpark at 386-985-4402 for Sunday nights race. Scotty Adema snares USA Sprints "Barn Burner" at Auburndale Speedway! 6/24 - This was the most exciting race in USA Sprints History as witnessed by fans, officials and even the racers themselves. Scotty Adema snared Victory away from a slowing Shane Kreidler in the late stages of the race to take home his 6th feature Win of 2005. Kreidler who is the 2003 USA Sprints Champion drove a great race from the pole position. "The car was really hooked up" explained Kreidler. Shane was flanked by Tim George in the # 1 Venice Wrecker Shaw on the front row. In row two Greg "The Jet" Leonard brought the Pooles Auto Body Avenger from position 3. Next to Leonard was newcomer and TBARA standout Dave Slawiak. Slawiak was driving the Dave Link Cool-Aid Air Special gambler. As a competitor in USA Sprints myself I am having a hard time explaining exactly what happened in this race. I have asked many drivers and even some fans as well as USA Officials and the answer was always different so I will sum the race up with this analogy. There were cars everywhere almost the entire race. There were cars sometimes 7 wide. There were battles galore. I had so many battles I had forgotten who I was racing (lol), funny but true. The top 6 or 7 cars were under a blanket most of the race. There was passing on the top and the bottom. Cars that were being lapped were racing side by side as were the cars attempting to overtake those cars, which created a major quagmire. I saw Greg Leonard blast through a hole barely wide enough but somehow made it. Cars were 2 and 3 abreast and ran side by side for most of the race. I saw cars drive across the rumble strips because the track was blocked. Please keep in mind this race never went yellow. The flagman who by the way did an outstanding job didn’t know who won the race. Heck even the drivers weren’t sure who won themselves. There is one fact that came from our first visit to Auburndale Speedway and that is, that all the drivers are winners in a race like this. I have personally spoken to most of the drivers and we all agreed that this race was a total blast and even though only one driver Won this race, there were no losers on this Saturday Night in Auburndale Florida. In conclusion I tip my hat to all the USA Sprints drivers and crews as well as the Auburndale Speedway staff for an awesome job. In the past 6 races Scotty Adema has proven himself to be a very formidable competitor but this race showed that Adema went out and snared this Victory with all the desire that Champions are made of. Here below is how Scotty Adema saw the race in his own words. Congrats Scotty and all the USA Sprints racers on a superb job well done. Adema: "After seeing how hot it was we decided to watch the first practice. Watching the cars go around we soon found the problem was going to be getting the car to turn on this tight little track. We went out for the second practice, and felt the car wouldn't be good enough to win. We made some adjustments and decided to go with that for the heat race. We started second row inside for the heat race and got ready for the green flag." " The green flag dropped and the car that started outside pole got a good jump. I fell into third hunting down second. The #79 car of youngster Dakota Stevens pushed up track just enough for me to get in the bottom grove. It took a few laps to catch the #85 of Greg Leonard to try to apply pressure for a pass. In turn 4 he pushed up and left the door open just little bit and I decided to try to squeeze by. I got under him and he gave just enough space for my car to race him clean. Once by him we got in clear track and I took off and left, still fighting the car that didn't want to turn." "After the heat race I was pretty worried about being able to pass with as close as the field was and the quality of cars in the field. We got pushed off and all I could see was a bunch of cars in front of me. I lined up eighth and got the belts tight and brakes hot, waiting on the green flag to drop. We fired off of turn four and all I saw was cars going everywhere. Cars were smoking the right rears and going three wide into turn one. We passed a few cars and got to the back of "Tiny" Tim George # 1. Tim was fast and very difficult to pass. I would go low, but his yellow sprinter was motoring down the straights. I tried him high going into turn one three times, but he still could come off and beat us to the gas." "We finally caught lapped traffic and he went low and I went high, the high line proved to be the way to go. Once by Tim the traffic was unreal. I couldn't tell if I was in second or third. The 85 car in second raced me hard, but I was just able to squeak by him in turn one. Just as I began to settle for second because I saw Shane Kriedler in the 52 car so far ahead, he started getting closer and closer and finally I caught him rather quickly which allowed me to get by. I later found out he had lost his power steering. He sure was running good and was going to be hard to beat. With about 3 laps to go we got the lead and led it from there to the end of the race. I think we ran a couple extra laps as the checkered was flying." "As I pulled into Victory Lane my heart was going a hundred miles an hour from such an intense race. I couldn't end this story without thanking all my crew guys for their support, but most of all, my dad and car owner Tommy Rice. Tommy is a great car owner supplying excellent equipment for me to drive. I also would like to thank Old Castle Precast and Motor City Transport my sponsors. My dad, whose adjustments made the car capable of going from eighth to first also were very vital to this Victory. Finally I would like to thank RC Roper and Chip Stick for giving us racers a safe, quality, and affordable place to race in the USA Sprints." 1) Scotty Adema #67- 2) Dave Slawiak # 63- 3) Tim George # 1- 4) Dennis Misuraca # 3d- 5) Greg Leonard # 85- 6) RC Roper # 92- 7) Dakota Stevens # 79- 8) Sean Namor # 10n- 9) Travis Bleimeister # 3b 10) Donnie Maxwell #5- 11) Michael Smith # 9 – 12) Geoffrey Styner # 15jr –13) Shane Kreidler # 52 – 14) Bob Parrow # 24. USA Sprints "Posse" Storm Auburndale Speedway! 6/14 - The USA Sprints Florida's # 1 Dirt Sprintcar Organization will make their 1st ever visit to the action packed Auburndale Speedway in Auburndale Florida Saturday Night June 18th. This will mark the 7th race on pavement for the 2005 Southern Thunder Tour season for the South Florida dirtcar Series. The races have been very exciting thus far as stated by the fans and Track owners. Many of the drivers and Teams are now getting a handle on pavement racing and the lap times have shown just that. There have been 2 different Winners thus far in 2005 with Scotty Adema, the "Fort Myers Flash", who is known as a pavement specialist, taking top honors five times. Along with Adema "Tiny" Tim George, multi time East Bay Champ, and Winner of the first race at Hialeah Speedway will make his first visit there as well. George will also take his narrow point lead over RC Roper into Saturday the night affair at the quarter mile speedplant. Adema has shown brilliance thus far and has the rest of the drivers doing "cartwheels" as they play catch up. Word has it that many of the States top drivers are also planning attending Auburndale. Current Eastbay regulars Donnie Maxwell, the Ford driver from Tampa along with Tim Holston and Danny Jones are expected. This weekends race will definitely have many wondering if anyone will catch the Tommy Rice owned # 67 J & J Sprinter of Adema. In addition, speculation has it that Bruce "Rocketman" Durden from Jacksonville is making plans. Durden is always a front runner no matter where he shows up. Up and coming driver Rick Byerly from Tampa will be making his first start as well. Other USA regulars that will be expected to run up front are Dennis Misuraca, Sean "Zippy" Namor, and Mike Hollywood Schroeder from SW Ranches Florida. Up and coming "Young Guns" Dakota Stevens and Michael Smith are in a heated Rookie Points battle and will be on hand. Smith has shown brilliance thus far in his Rookie season with steady top 10's and now sits in 4th place in the overall Points. The 2003 USA Sprints Champion Shane Kriedler will make his return after demolishing his car at a earlier event this year. The Danny "Coach" Kriedler Team has also purchased a new J & J mount and will have that car ready very soon. Among the USA Sprints newcomers this year hailing from Cape Coral are Rookie Jeff "G-Man" Styner in the 15jr and the # 63x of Dave Link who returns to the seat in a Sprinter after only 2 races ever. Link is very happy with running in the USA Sprints and is showing steady improvement each and every race in the Cool-Aid Air Special. Bob Parrow is now in 9th place in points and is poised for his best run of the year. Be sure to make plans for this weekend's race, as this could very well be the most competitive of the year. Call the Track @ 863-967-3598 for more information or visit the USA website at www.usasprints.com . Scotty Adema Claims 5th in a Row in USA Sprints Racing! 6/10 - The "Fort Myers Flash" Scotty Adema made it 5 in a row bye blasting his way around the Miami Speedplant in fine form. Tommy Rice, Jerry Adema and crew again had the car set-up and performing flawlessly. The was the 3rd race Win in as many races at Hialeah for Adema and the Old Castle Precast Racing Team. Tim George # 1 & Dakota Stevens # 79 made up the front row followed by the cars of Michael Smith # 9 and Sean Namor # 10n in row 2. At the drop of the green the 2 front row cars of George and Stevens powered off of turn 4 and the field followed. The action was fast and furious as the cars were bumping and rubbing all thru turns 1 and 2. Tim George in the # 1 darted out to a early lead from his pole position and began to up the pace as his tires were gaining heat. Young Michael Smith # 9 was in tow followed by Dakota Stevens # 79 Sean Namor # 10n and Scotty Adema # 67. Adema was again working the high side. Scotty caught the # 79 and # 9 and made a beautiful move to shoot bye the dueling pair of Rookies on lap 6. Sean Namor was steadily working his way thru the pack as he came up on the 2 Rookie drivers who themselves battling for position. RC Roper in the # 92 who got shuffled to the back was now decisively working his way towards the front. Travis Bleimeister in the # 3b from Sarasota dropped out with brake troubles on lap 8. This was Travis’s first pavement race ever. By Lap 9 "The Fort Myers Flash" was now in second after getting by Smith the previous lap the chase was on. George was not going to make it easy for Adema and he didn’t. Scotty applied the pressure hot and heavy and on lap 11 shot by George going into turn 1. Adema got sideways through the middle until finally squeezing by the # 1 coming out of turn 2. Back in the pack there was an all out frenzy happening as the cars of Sean Namor # 10n and RC Roper # 92 were waging a serious side by side war. The veteran drivers ran side by side for 7 laps and never made contact. They were exchanging positions back and forth as were Michael Smith # 9 and Dakota Stevens # 79. As the race progressed Adema # 67 showed his skills in lapped traffic as he maneuvered his machine nicely around the ¼ mile oval. Roper eventually got by Namor, chased down the 2 rookies and made the pass in 3 wide traffic. Mike "Hollywood" Schroeder # 6 was in 7th and running a very smooth and steady race all by himself. Sean Namor challenged the two "Young Guns" of Smith and Stevens. These Rookie drivers who always seemed glued during the races. Both racers have seen hundreds of laps racing together in Go-Karts and now are doing the same in Sprint Cars. Roper caught George with 2 laps to go and had an awesome race to the flag with Timmy barely edging out RC at the finish for 2nd. At the Checkers it was Adema # 67, George # 1, Roper # 92, Namor # 10n, and Stevens # 79 rounding out the top five. Smith # 9 was 6th was followed by Mike "Hollywood" Schroeder’s # 6, Scott Rocchio # 16, Bob Parrow # 24 and Dave Link # 63 in only his 2nd start in the former Dean Bartholomew owned Gambler came home 10th . The next race for the USA Sprints is next weekend @ Auburndale Speedway Saturday night June 18th @ 7pm.Call the Track for details and or directions at (863) 967-3958 Also please feel free to visit our website at www.usasprints.com for all the latest news and results. Fort Myers - USA Sprints Promoter RC Roper announced today that they have added 3 races to the 2005 Southern Thunder Tour Schedule. Roper comments: "We would like to thank Citrus County Speedway Promoter Don Cretty and Hialeah Speedway Promoter Andrew Ogden for giving the USA Sprints these additional races and we and appreciate the hospitality given to our Racing Family." Roper adds: "We have had some really great racing at both of these Tracks and the guys are looking forward to returning". The dates set aside for the remainder of the Citrus County Races are July 16th and August 13th. The Hialeah Speedway dates are May 28th, June 4th and tentatively July 30th which is slated as the "Hialeah 35 Special" big money show. Details of the Hialeah Race are still being worked out but expectations are high that a very big nite is in store. Hialeah is in its last year of existance and Drew (Mr Ogden) has worked very hard to keep the Track open this long. The Track is in its 54th year of operation has seen many famous racers who have compteted there including Bobby Allen (Scruffy) and Steve Smith whom were considered to be "The Original Outlaws". Both were from the Miami area and both have raced at Hialeah. Hialeah has great History and even many Nascar greats have raced there including The Alabama Gang of Red Farmer, Bobby, Donnie and Davey Allison along with other greats like Bobby Dotter, Gary Balough, Rod Perry. Florida legends like Dickie Anderson, Daryl Shelnut, Mike Franklin, Bobby Coyle and Mario Gosslin got thier starts at Hialeah. Sand Mountain Speedway which was to open on May 22nd has postponed the event as they are still not quite ready to go.The USA Sprints are hopeful that SMS will be ready soon as all the details are now being sorted out. We will do our best to keep everyone posted as we get this information. The Track is having a special practice for Sprintcars on Sunday May 22nd. The next USA Sprints race will be Saturday night May 28th @ Hialeah Speedway. Stay tuned for more information on USA Sprints upcoming match races on dirt. For all the latest news, schedule changes and updates please visit the website www.usasprints.com or call RC Roper @ 239-872-0168 with questions. USA Sprints "Posse" Ride into Hialeah! The USA Sprints Florida’s # 1 Dirt Sprintcar Organization will make their 3rd visit to the famed Hialeah Speedway in Hialeah Florida Saturday Night May 7th for a much anticipated return to the paved 1/3rd mile oval. This race is the 4th pavement race of the 2005 Southern Thunder Tour season for the dirt cars. Coming off his most recent Win @ Citrus County Speedway April 30th "The Fort Myers Flash" Scotty Adema has now won 3 races in a row which is a USA Sprints record. So far Adema, a pavement specialist, has driven the Tommy Rice owned J & J Sprinter flawlessly enroute to the record. There have been 34 different winners in 48 total races over the last 2- ½ yrs in the USA Sprints. Up and coming USA Sprints "Young Guns" expected are Michael "Bones" Smith from Ocala and Dakota "Lead Foot" Stevens from Zephrhills. Together these 2 former go-kart racers have shown brilliance thus far in the early going. These Rookie drivers are friends on and off the racetrack and at only 15yrs old each have shown great potential. Smith is currently 3rd in points and has also displayed great maturity for his age. Among some of the USA regulars that will make Hialeah are points leader Tim George and Sean Namor along with RC Roper. Other notables such as Larry Gentsch, Bob Parrow, Dennis Misuraca and Mike "Hollywood" Schroeder, who resides just up the road in SW Ranches Florida will also be there. Be sure to make plans for this weekend’s race. Call the Track at 305-821-6644 for more information. The USA Sprints Florida’s # 1 Dirt Sprintcar Organization will make their 1st ever visit to the action packed Citrus County Speedway in Inverness Florida Saturday Night April 30th. This will mark the 4th race on pavement for the 2005 Southern Thunder Tour season for the South Florida dirtcar Series. There have been 2 different Winners thus far in 2005 with Scotty Adema, the "Fort Myers Flash", who is known as a pavement specialist, taking top honors twice. Along with Adema "Tiny" Tim George, multi time East Bay Champ, and Winner of the first race at Hialeah Speedway will make his first visit there as well. George will also take his strong point lead into Saturday the night affair at the quarter mile speedplant. Word has it that many of the States top drivers are also planning attending CCS. Current Eastbay regulars Donnie Maxwell, the Ford driver from Tampa along with Tim Holstein and Danny Jones are expected. This weekends race will definitely have many wondering if anyone will catch the Tommy Rice owned # 67 J & J Sprinter of Adema. Rice is also rumored to have another car soon in the works for a 2 car effort. The Rice team is based out of North Fort Myers and the car is from Ohio and runs a 305 cu in power plant, which makes his performance even more astonishing. Other USA regulars that will be expected to run up front are Dennis Misuraca who ran a great race at Hialeah until he ran out of fuel on lap 18 in 2nd place. It was said he gave up 5 gals of fuel to another competitor who was short himself. This was a hard blow for the Sanford Florida pilot. Expect Team Misuraca to return as strong as ever. Pro Challenge standout Rod Sanders who ran 2nd his only time out, will be a force as well as up and coming "Young Guns" Dakota Stevens and Michael Smith. Smith has shown brilliance thus far in his Rookie season with steady top 10’s and now sits tied in 2nd place in the Points tied with veteran campaigner RC Roper. Among the USA newcomers this year hailing from Cape Coral are Rookie Jeff "G-Man" Styner in the 15jr and the # 63 of Dave Oblinger who returns to the seat in a Sprinter after nearly 20 years. Oblinger has Winning experience and could be a dark horse in this years point battle. Car owner Dave Link is very happy with Oblinger’s return to the seat and it showed with a fine 3rd place finish at Hialeah last time out. Bob Parrow, Sean Namor and Mike "Hollywood" Schroeder will always be in the hunt and are drivers to keep your eyes on. Be sure to make plans for this weekend’s race. Call the Track @ 352-726-9339 for more information. The "Fort Myers Flash" Scotty Adema Strikes Again at Hialeah! Scotty Adema "The Fort Myers Flash" showed why he has the pavement car to beat in USA Sprints racing action thus far in 2005. Adema won both his heat and feature race in fine fashion but not without a lot of excitement thrown in for good measure including some close calls. The Hialeah race fans were on their feet and waiving as local racer Mike "Hollywood" Schroeder # 6 from SW Ranches Florida and Dennis Misuraca # 3 from Sanford brought the field to the green. They were followed by Sean "Zippy # 10n and newcomer "Super" Dave Oblinger # 63d piloting Dave Link’s Cool- Aid Air Gambler. Misuraca in the # 3 Schnee Chassis was hooked up at the drop of the green and rocketed out of turn 4 to take the early lead. Schroeder, Oblinger, George and Namor chased Misuraca. The # 3 stretched his lead to ten car lengths by lap 10. The caution waived on lap 11 for Sean "Zippy" Namor in the Young Oil Company # 10n, which blew a motor and oiled down the track. Meanwhile Adema worked his way methodically through the pack and wasted no time in passing by Tim George to lay claim the 2nd position on the lap 11 restart. Back in the pack there was a mad scramble going on as George # 1,Oblinger # 63, Schroeder # 6,Michael Smith # 9 and RC Roper # 92 were waged in an all out war. The Hialeah fans were treated to a battle "royale" as these five drivers were fighting an all out war for a good 15 laps with sparks showering, rubber burning and smoke flying according to eye witnesses. Cars were sideways and front wheels were up in the air and miraculously there were no wrecks. Back up front Adema in the Motor City Transport J & J caught the # 3 of Misuraca and the 2 drivers battled to lap15 when Misuraca caught lapped traffic and Adema "flashed" by on the outside to take the top position. On lap 18 Misuraca exited the track with fuel problems. At this point it was Adema, George, Schroeder, Oblinger, Smith and Roper. "Super Dave" Oblinger a former Modified standout was subbing for Larry Gentsch in the # 63.Oblinger drove a "whale" of a race in his first ride in a sprint car in nearly 20 years showing he hasn’t lost a step. Schroeder and Oblinger traded paint back and forth, as did Michael "Bones" Smith # 9 and RC Roper # 92 "The Racin Cowboy". When the checkered flew the fans were cheering because they had watched one heck of a race and were appreciative of the drivers efforts. The final rundown was Adema # 67,George # 1,Oblinger # 63,Schroeder # 6,Roper # 92 and Michael Smith in the # 9 Smith’s Garage entry. Tim George ran his usual trouble free race night and maintained his points lead with solid results. He now has 356 points and leads over RC Roper and Rookie sensation Michael "Bones" Smith who are now tied with 309 points each in 2nd. Scotty Adema has 250 points in 4th position and is followed by Mike Schroeder with 224 points in 5th place. The next USA Sprints race will be April 30th at the Citrus County Speedway in Inverness Florida. A full field of Sprints are expected with some new faces thrown into the mix as well. Please check out all the latest news and updates on the website at www.usasprints.com. The USA Sprints Florida’s # 1 Dirt Sprintcar Organization will make their 2nd visit to the famed Hialeah Speedway in Hialeah Florida Saturday Night April 16th for a much anticipated return to the paved 1/3rd mile oval. This race is the 3rd pavement race of the 2005 Southern Thunder Tour season for the dirt cars. There are many Drivers who will compete for the very coveted USA Sprints Championship Title including 2004 Champ Andy "Hammer Down" Kelly. Kelly will return to Hialeah to chase after "Tiny" Tim George who won last time out at Hialeah. USA’s 2003 Champ, Shane Kreidler crashed hard and is hopeful to return in his new car. Word has it that many of the States top drivers are also planning an assault in 2005. Donnie Maxwell, the Ford driver from Tampa along with Eddie Newel, Dennis Misuraca and John Cinkota from Orlando as well. This years Championship Title could be the best battle ever as the drivers will need to adapt from dirt to pavement. Other notables expected are Scotty Adema who won the Starwars Challenge race back in February and Pro Challenge pilot Rod Sanders who ran second last time out. Up and coming "Young Guns" expected are Dakota Stevens and Michael Smith from Ocala. "Bones" (Smith) has been outstanding and currently sits in the second points position. Among the USA regulars that will make the Hialeah race are Sean Namor, RC Roper, Larry Gentsch, Bob Parrow, David Kelly and Mike "Hollywood" Schroeder who lives just up the road in SW Ranches Florida. Be sure to make plans for this weekend’s race. Call the Track at 305-821-6644 for more information. Scotty Adema "Rockets" to Starwars Victory @ Charlotte County Speedway! 3/18 - Scotty Adema "The Fort Myers Flash" in the #67 Tommy Rice owned J & J Chassied Dirt Winged Sprinter rocketed his car to the first ever "STAR WARS" Challenge race held at the Charlotte County Speedway between the USA Sprints and FAST Sprints organizations. This was by far his most impressive Win so far in USA Sprints competition. The Sunshine Network taped show was kicked off to a very enthusiastic but curious crowd. All bets were off now and the 2 groups of drivers were set to get down to some serious business of racing. After the Heat Races Officials conferred and it was decided that the "FAST Sprints" Non Wing pavement group cars would start in the front for the 30 lap feature event as it was obvious the Winged dirt cars had more grip due to the very hot and slick track conditions along with extra downforce. FAST Sprints drivers Daryl Smith #40 and Curtis Carter 2c jockeyed from the front row and were chased by the Max Steele # 0 of Charlie Ladner and Jimmy Alvis # 48 in the second row. At the drop of the green flag the racing got hot and heavy. There was little grip on the hot slick surface so the cars were making adjustments immediately with thier lines. Daryl Smith # 40 was looking strong as was and Charlie Ladner # 0. On lap 3 Smith slid high allowing Ladner to slip past in turn 2. Jimmy Alvis moved into 3rd in the #48. On lap 5 Curtis Carter # 2c got high out of the groove and looped the car bringing out the caution on lap 6. When the race resumed Ladner still was in command but when exiting off of turn 4 his car spun and brought out another caution flag. Rod Sanders in the Pro One Racing # 2 J & J made it known that he was going to the front and was now in the lead due to Ladners spin. Meanwhile it seemed that the Winged cars that were capable of passing chose the high side and the Non Wing cars were on the bottom. Scotty Adema, Tim George and RC Roper were steadily working thier way from the back. Adema got by the #48 of Alvis to track down the # 2 of Sanders and on lap 17 moved under the Pro One Racing chaueffer to take the lead. The #48 of Alvis and George # 1 were in a heated battle when the 2 cars got together resulting in Alvis spinning off of turn 2. The order was now Adema (W), Sanders (W), George (W), Daryl Smith (NW), JT Thompson (NW) and the Michael Smith # 9 Winged car. On lap18 the yellow waived for Rookie USA driver Larry Gentsch in the # 63 when his motor blew in turn 3. After a restart on lap 20 the cars of JT Thompson # 87 and Young Michael "Bones" Smith # 9 tangled resulting in a flat left rear tire on the Michael Rudolph machine. Meanwhile silently working his way from dead last was the # 92 of RC Roper to claim 4th from Daryl Smith's Ken Sands owned # 40, just before the last caution flew. Cars were all over the Track and the fans were treated to a very unusual race but an entertaining one at that. Dennis Misuraca in the # 3 and Tommy Nichols put on a wild side by side show for a bunch of laps as were Michael Smith #9 and Bill Pettijohn in the #44. Scotty Adema brought home another Win for car owner Tommy Rice and led the remaining 5 laps. He was chased by Rod Sanders in a USA dirt winged car who came home 2nd.This was Sanders first ever Sprintcar race. "Hot-Rod" was followed by Tim George in a winged car, RC Roper in a winged car with Daryl Smith being the first non wing car to cross the finish line in 5th. Daryl Smith did an oustanding job and was cheered by the crowd. There were a total of 17 cars on hand for the race. Official Finish - Scotty Adema # 67, "Hot Rod" Sanders #2, "Tiny" Tim George #1, RC Roper #92, Daryl Smith #40, Dennis Misuraca #3, Tommy Nichols #03, Charlie Ladner #0, Micheal Smith #9, Bill Pettijohn #44, JT Thompson #87, Jimmy Alvis #48, Curtis Carter #2c, Larry Gentsch #63, Bobby Gordon #29, Dakotah Stephens #79- DNS, Tighe Schloss #8s- DNS. Tim George flexes his muscles @ Hialeah with a very satisfying Victory! Fort Myers, FL - 3/8 - The USA Sprints made their first ever visit to the famed Hialeah Speedway and "Tiny" Tim George # 1 proved that he too will be a force to be reckoned with on the pavement as he garnered his first ever Win on the hard stuff in Miami. David "Skeeter" Kelly's # 12 and Sean "Zippy" Namor's # 10n brought the USA Sprints to the line followed by Andy "Hammer Down"Kelly's # 11 and Mike "Hollywood" Schroeder's # 6. Skeeter drove off of turn four to take command but immediately 2 cars got tangled off of turn 4. The cars of Shane Kriedler # 52 and Andy Kelly # 11 were damaged and were towed from the Track. The race was restarted and again Skeeter Kelly got the jump. He was followed by Sean Namor # 10n and Mike Schroder in the # 6. As the cars came off of turn 4 for lap # 2 Larry Gentsch # 63 hit the 4th turn wall and slid down the front straight-away with heavy damage to bring out caution 2. Skeeter Kelly was still in control in the Staggs Tree Service # 12 as he took the green again off of turn 4. Just as the cars were starting to jockey for position the car # 24 of Bob "The Arrow" Parrow slowed in turn 2 to bring out the 3rd caution. The car # 12 was up to the task and powered off of turn 4 for the restart. This time he was pursued by Mike Schroeder # 6 and Tim George # 1. Kelly stayed out front when the lead cars came up on lap traffic on about lap 15. As the cars were dicing back and forth Kelly slid high off of turn 2 allowing Tim George to slide by and take over the lead. He was now trailed by Kelly,Namor and Schroeder. RC Roper was in fifth but was pressured very heavily by young Rookie sensation Michael "Bones" Smith in the Smith's Auto # 9. Smith got by Roper's machine to crack the top 5 by lap 17. Up front George was starting to pull away but the real battle was for 2nd thru 4th. David hung on for 2nd followed by Namor and Schroeder. Michael Smith garnered his first ever USA Sprints top 5 finish. This was also his first ever pavement race in any kind of race car as well. RC Roper struggled with motor problems to bring home 6th. He was chased by Scott Rocchio # 16,Bob Parrow,Larry Gentsch,Andy Kelly and Shane Kriedler. The USA Sprints South Florida's only Mud Slingin Sprintcar Organization will meet heads up against Florida's only 360 Non Wing Group the FAST Sprints @ Charlotte County Speedway Sunday March 13th at 12 pm. This Sunshine Network and Satellite TV will tape the ever popular FAST Hour and will include the first ever "Florida Sprints Starwars Challenge" Match Race in its Racing program for the FASTRUCK Series and the ever popular "FASTKIDS" as well. USA Sprints Posse Storms Hialeah Speedway! 3/1 - Saturday night March 5th will be the first time ever that Florida's # 1 Premier "Dirt Winged" USA Sprints Posse will storm the North Miami area 1/3 mile pavement oval. Local racers like Sean "Zippy" Namor # 10n ,Bob "The Arrow" Parrow # 24 ,Scott "Rock n Roll" Rocchio # 16 and Ron "Happy" Armstrong # 56 are very excited about racing in thier own backyard and have been seen testing lately at the1/3 mile oval. These cars are often seen pulling wheelies and sometimes they may flip wildly end over end at speeds well over 140 mph if the drivers wheels touch.Sprintcar Racing is one the most exciting forms of oval racing there is and some of the very best racers in the World are sprintcar drivers like Nascar stars, Jeff Gordon, Tony Stewart, Ryan Newman and Kasey Kahne.Indy Car Greats like, Mario Andretti, AJ Foyt, Pancho Carter & Johnny Rutherford are bonified Sprintcar Drivers too! The USA Sprints are a traveling "Winged Dirt Sprintcar Series" that has racers who have Won hundreds of Races and Dozens of Championships.The USA Sprints are a Nationally recognized All-Star Series that has a $40,000 contingency program with National Sponsors and All-Star Drivers who live in States as far away as New York and Colorodo and Arizona. Sean Namor who is one of the top USA Sprints drivers states "When there is a chance to race locally to showcase our cars and talents that gets everyone pumped". Family, friends,co-workers and neighors will be in attendance says Bob Parrow. " People are always asking me when are we going to race locally ". According to Bob Parrow now is thier time! These Sprintcars are some of the most powerful types of oval track cars that will ever race in the Miami area. They weigh about 1400 lbs and have over 500 horse-power with no transmissions or batteries and no starters. They burn methanol fuel and need to get push started.These cars have 25 sqaure feet wings on top and 12 square foot front nose wings.The top wings develope well over 700 lbs of downforce @ 100 mph. Its easy to see how the level of excitement has been raised from the addition to the local racing schedule and what it means to these local racers to race near home. Be sure to come out and visit the Famed Hialeah Speedway Saturday night March 5th at 7pm and witness the first ever race for "Winged Dirt Sprintcars" on pavement in the Miami area. 3/1 - The first ever "Florida Sprints Starwars Challenge" will be rescheduled for Sunday March 13th. The original date of February 27th was postponed due to rain. Heavy amounts of rain pounded the Charlotte County area Saturday night and Sunday morning forcing CCS Promoter Leroy Davidson to postpone the event. This event will be taped to air on the Sunshine Network. The Ground Thundering-Pavement Pounding FAST Sprints will match race against the Dirt Slinging "Winged Warriors" The USA Sprints in a series of Heat Races followed by a 30 lap Feature. What will make the racing very intriguing will be that purpose built Pavement Non-Winged 360's will match race Purpose built Dirt Winged Limited Sprints. The cars have tested together and adjustments have been made to create a competitive "playing field". There has been much talk about who will flex thier muscles on both sides of the fence with the FAST Sprints and USA Sprints. Fact is both groups have very accomplished racers who are capable of winning any race in any circumstance. Race fans around the State have cited that a few more drivers who had previous committments will show this time around. One thing is for sure it will be one of the most exciting races that anyone anywhere will see in the State of Florida for Sprintcars. Fort Myers Florida - 2-16-05 - Going into their Fourth Season the USA Sprints have over 60 drivers on their mailing list and are well on their way to many more. Due to the destructive Hurricane season, a sluggish economy and very unfortunate circumstances three Florida area Race Tracks closed their doors. After much consideration and debate the decision was made to race this year on both dirt and pavement. Fans from all over the State are excited about the opportunity to watch the dirt cars go both ways. The Florida Sprints Starwars Challenge Race is the first race of its kind that is known to happen in Florida. Dirt Winged Limited Sprints racing side by side against Pavement Non Wing 360 cars. The FAST Sprints have USAC style lowered and very high powered Offset chassis with coil over design suspension systems and lighter overall weight. USA Sprints weigh in at 1600 lbs with drivers and less powerful motors. The FAST Sprints weigh in at 1400 lbs with drivers. Both camps are very anxious awaiting the February 27th Sunday afternoon date at Charlotte County Speedway. There will be 22-25 events planned at 7 Florida Area Race Tracks as well as a couple Non Points USA Races. In addition a North /South Challenge Series is in the works for the Florida Triple Crown with the Florida Sprint Car Association for Summer. There is also Tentative plans in the Fall to race with a major Touring Series in October which will be Championship caliber type racing. The pavement tracks included so far are Citrus County Speedway,Charlotte County Speedway and Hialeah Speedway. Other tracks are expected to join in soon as the details can be arranged. The Sand Mountain Speedway is expected to be a part of the tour by Spring or sooner. Also Putnam County Speedway will host many races for the Florida area Sprints during the year. Details are still being worked out so stay tuned. The Volusia County Speedpark and Putnam County Speedway will host the Florida Triple Crown on July 2nd, July 3rd and finish at Putnam with a Big Championship Show on October 15th. The USA Sprints are excited about the bright future as the organization continues to grow and expand in 2005. The USA Sprints are currently working with many National Companies to form a cooperative Contingency Sponsorship arrangement and the results have been outstanding. All the details are now being sorted out as the USA Sprints expect to announce the full package for the 2005 "Southern Thunder Tour" very soon. Many other Florida area Tracks have also shown interest and plans are already in place for several additional races to be added throughout the Year. 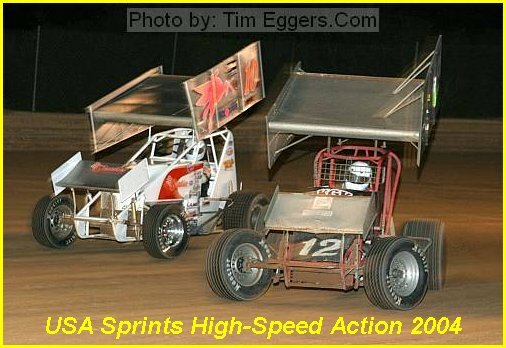 Please visit the USA Sprints website at www.usasprints.com and check out the schedule and other news items as well. Also please feel free to join the all new message board! There is a section there for the Florida Starwars Challenge Race and the FAST Sprints too. Also if anyone has any questions tips and or advice please feel free to post away. The Florida Sprints "Starwars Challenge"
Fort Myers, Florida - Feb 7 - The USA Sprints South Florida's only Mud Slingin Dirt Sprintcar Organization will meet heads up against Florida's only 360 Non Wing Group the FAST Sprints @ Charlotte County Speedway Sunday February 27th at 2pm.This Sunshine Network and Satellite TV will tape the ever popular FAST Hour and will include the first ever "Florida Sprints Starwars Challenge" Match Race in its Racing program for the FASTRUCK Series and the ever popular "FASTKIDS" as well. The USA Sprints have designed a set of Rules that each team must run a "dirtcar" package. These cars by design have a higher center of gravity and roll centers which make the cars loose by nature. They use only torsion bars which are used almost exclusively by Dirt Cars Nationwide. The FAST Sprints have USAC style lowered and very high powered Offset chassis with coil over design suspension systems and lighter overall weight. USA Sprints weigh in at 1600 lbs with drivers and less powerful motors. The FAST Sprints weigh in at 1400 lbs with drivers. USA Sprints drivers like 2004 Champ Andy "Hammer-Down" Kelly, Bruce "Rocketman" Durden, Florida Hotshoes Greg "The Jet" Leonard along with Danny "The Missell" Martin and Sean "Zippy" Namor will take on the FAST Sprints contingent of Tommy "The Hunter" Nichols, Lee "Slick" Cipray, Jimmy "Wildchild" Alvis and Bobby "Big Bird" Gordon. Word has it that "Mean Gene" Lasker will make his return to pavement as well but hasn't decided on what side he will race with. Fans from all over the State are buzzing about this new Sprintcar rivalry match racing promotion created by Bobby Deihl and Carla Rudloph along with RC Roper the two Series Promoters and CCS Track Owner Leroy Davidson.Specualtion is that some of Florida's best drivers are planning an assault on this venue. For up to date news and other information please visit the USA Sprints website @ www.usasprints.com and drop us a line on the new message board.Also please feel free to visit www.fastruckinc.com for details on the FAST Hour schedules. Fort Myers Florida - 1/19/05 - South Florida's one and only Dirt Sprintcar Racing Organization will again make waves in the Sunshine State in 2005 with a very interesting twist in the schedule. This special twist along with heads-up match racing will enter a new era for Florida Sprintcar Racing. The South Florida based Sprintcar group will compete on both Dirt and Pavement with Purpose built Dirt cars only. The USA Sprints concept is to keep costs low for the drivers and Teams as well as providing an affordable purse for the Florida area Race Tracks. Each car must maintain the "built for dirt" purpose. This is to insure that all cars are for dirt racing only. The rules have been written to keep the costs low for making the transition from dirt to pavement a minimum expense, thus the amount of time needed for the transition will be limited as well. The USA Sprint Car teams are very excited about this opportunity. USA Sprints will be the one of few or possibly the only Sprint Car group who will race both dirt and pavement with the same purpose built dirt cars. In addition, there are plans now in the works for the USA Sprints which are 355 powered "Winged" Dirt Cars to compete heads up against another well known 360 Non-Wing pavement group. The testing will happen in the next week and hopes are high that a level playing field can be created. This concept has been discussed for a few years and several Florida area promoters are hard at work to make this happen. Many USA Racers like Sean "Zippy" Namor, are pleased that USA has taken a non traditional approach to creating new and interesting racing for Florida fans. Sean comments "sign me up this will be wild". Other drivers like Andy Kelly who is the reigning USA Champ have stated " Well it sure is different and could get very crazy out there thats for sure....count me in". There will be 20 to 25 events planned at seven Florida Area Race Tracks in 2005 and possibly a couple Non Points USA Races this year as well. In addition, a North /South Challenge Series is in the works for the Summer of 2005 with the FSCA Sprints from Jacksonville. This year will mark the return of the very popular Florida Challenge Series Triple Crown. This year an overall points Champion will be crowned who has amassed the most points over the 3 race Series along with the top 5 in points recieving additional cash bonuses and awards as well. Putnam County Speedway and Volusia County Speedpark are signed up thus far thanks to the efforts of FSCA Promoter Otto Scrape. Hopes are high that Sand Mountain Speedway and possibly Hendry County Speedway will join the Tour at some point during the season too! Putnam County's Promoter Mike Partin is now planning a big Championship caliber show on October 15. The USA Sprints are looking forward to another great year of Sprintcar Racing and expect a new crop of top drivers to immerge from other classes as well as rookie hopefuls to compete for the very prestigous 2005 Championship. This season will certainly put a high caliber Driver on the map because he or she will have shown to to be the best on both dirt and pavement. Stay tuned the the new 2005 schedule will soon be released.For more information and the latest news visit the website at www.usasprints.com. USA Sprints Return to Charlotte County Speedway! 12/6 - The USA Sprints will make thier 2nd visit to the famed Charlotte County Speedway in Punta Gorda Florida Saturday Night Decmeber 11th for a special Exhibition Race on the 3/8ths mile Oval.This race was planned to kick start the 2005 Southern Thunder Tour season with a new "pavement experience". There are many Drivers who will compete for the very coveted USA Sprints Championship Title including 2004 Champ Andy "Hammer Down" Kelly. Kelly will return to defend his Title and will again chauffer his Sensinich Propellors,Big Tree Nursery Maxim Special. Due to many Florida area track owner changes at several of the main Race Tracks there was some speculation as to which direction USA Sprints was headed. All the facts were gathered and the descision was made that the South Florida based Sprintcar group would compete on both Dirt and Pavement with Purpose built Dirt cars only in 2005. The rules will be very strictly enforced.All the drivers are excited because many of them will be competing on pavement for the first time including 2004 Champ Andy Kelly and brother David "Skeeter" Kelly as well 2003 Champ Shane Kreidler. Word has it that many of the States top drivers are also planning an assault in 2005. This years Championship Title could be the best battle ever as the drivers will truely need to adapt to the changing Tracks from dirt to pavement.Other notables expected are TBARA 2003 Rookie Scot Adema and Former Legends and Midget Champion Rod Sanders.Up and coming "Young Guns" expected are 2004 USA Sprints Rookie of the Year Mikey "The Kid" Davis along with former USAC racer Ron "Happy" Armstrong.Among the USA regulars that will make the CCS Race are Sean Namor,RC Roper and Scott Rochio. Look for the USA Sprints coming to a Track near you! Any questions about the USA Sprints please contact RC Roper @ 239-872-0168 or visit the website at www.usasprints.com for more information.